When a company is confident about a new product, they relish the opportunity to have others compare it to the competition. That’s certainly been the attitude of the folks at BFGoodrich, who for years have been giving journalists the opportunity to test their products against the competition. We were invited last year to test out the new BFGoodrich g-Force COMP-2 tire, and this year we were invited back to test the all-new BFGoodrich g-Force Rival at New Orleans Motorsport Park. The Rival was designed to fill out BFG’s product lineup in the g-Force category between its COMP-2 street tire and its pure racing tires. The Rival utilizes racing technologies which provide extreme grip on the street and on the track and is designed specifically for autocrossing and track day events. 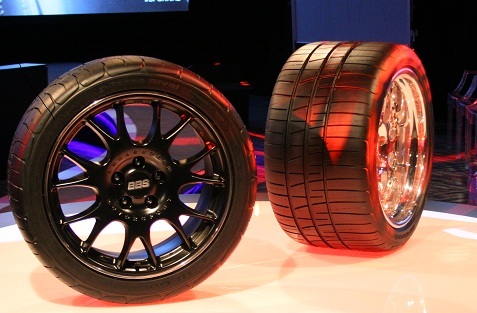 It’s a tire that will help enthusiasts race on the track, but they can drive home on the tire as well. All of the events they planned for us were designed to demonstrate the incredible grip achieved by these tires, and we were going to drive some great cars with the BMW E46 M3, Ford FR500 Mustang, Subaru WRX, and Mazda MX-5. It was going to be a great day! Razor-sharp reflexes – The Performance Racing Core™ (PRC) with a reinforced internal structure reduces sidewall flex for instant steering response. Designed to stick – Asymmetric tread with large, solid tread blocks on the outside shoulder to optimize cornering grip. Raise the limit – Extreme Tread Edge (ETE) design brings tread compound farther down the shoulder for increased grip in hard cornering and predictable feedback. The day was set up so we could feel the tire in action and compare it to the competition, along with the other tires in the BFG lineup. We got started with a skidpad test featuring the Mazda MX5 Cup. Cones were set up in a circle and each of us got the chance to test three BFG tires, starting with the COMP-2, then moving to the Rival and finally the R1 racing tire. It was fun getting up to a high speed, locking the wheel and then squealing around the track with an instructor in the passenger seat prompting us to go fast and really push the tires. The feel of the Rivals was much different than the street tire, with a huge improvement in grip, while the Rivals felt much closer to the R1 racing tires. The main different was that the Rival seemed more forgiving than the R1 racing tires. It was a great exercise that got us warmed up for some autocross. The next stage for our group was the Subaru WRX STI autocross testing the Rivals against the Hankook Ventus R-S3 and the Toyo Proxes R1R. The course was fun and frankly there was a huge difference as the grip of the Rivals was noticeably better than the competition. Next we got to drive the Mustang FR500 (the racing version of the Mustang) on the full NOLA track. It had been a year since I got to drive the Mustang Boss at the Miller race track in Utah, so I was pretty rusty, but this was still incredibly fun. We compared the Rivals to the Falken RT-615K in this exercise. I definitely noticed the difference in the curves. Our last event behind the wheel was a long-course autocross in the BMW E46 M3, and here we compared the Rival to the Hankook Ventus R-S3. This event was the most fun for me, as I felt much more comfortable on the autocross as opposed to the full track with the Mustang. The course was fun and challenging, and the Rival blew away the competition here. The grip and response was superb, while the Hancock offered a much-less confidence inspiring experience. Overall, the Rival definitely lived up to the goals of the designers. Even though I have little experience racing, I’m very confident after these tests that enthusiasts are going to be thrilled with this tire, and that was definitely the impression of other journalists at the event, many of whom had significant racing experience. The new Rival will be available for pre-order on February 1st from TireRack.com, so definitely consider checking them out if you want to improve your times at the track. The last event of the day included “hot laps” where the pros and instructors did laps in the Mustang FR500 and we got the opportunity to ride shotgun and see how the experts did it. Here’s a video from my lap, and you can sense how much fun we had.